“50:01” is the 7th release by Mecha/Orga. In this cd-r, Yiorgis Sakellariou continues to use numeric namings. In these three new pieces, field recordings are the sxclusive sound sources. The pieces were performed in real time with the use of AudioMulch and a MIDI controller. “18:03” A discreet and static piece with subtle changes. Field recordings made in Naxos island, July 2008. Performed in September 2008. “17:02” Machine sounds in a continuous noisy drone. Field recordings made in Athens, May 2008. Performed in May 2008. “14:51” Powerful crescendo of water sounds. Field recordings made in Tunisia, December 2008. Performed in January 2009. Yiorgis Sakellariou macht es sich bei seinen Albumtiteln vergleichsweise einfach: jedes Werk wird einfach nach der Gesantspieldauer benannt. Auch die einzelnene Tracks, eher als Movements in einem Gesamtthema zu sehen, tragen als “Titel” nur ihre jeweiligen Laufzeiten – ein konsequentes Verfahren, welches den Blick auf den Faktor Zeit lenkt, andererseits nicht durch Fanatsienamen falsche Assoziationen weckt. 50:01 it ein grauer, metallisch-sirrender und abstrakter Klangstrom, den man vielleicht als aggressive ambient bezeichnen könnte. Viele Frequenzübersprünge durch engmaschiges Setzen von Tonhöhen passieren hier, die eine Hin und herflitzen von Impulsen innerhalb des Sounds zur Folge haben. The slightly out-of-focus photograph (by Anton Maiorov) in which “50:01” is wrapped, is a landscape of (from the bottom up) bleached-out sand, a sad body of water, and the shore beyond. This visual serves as a perfect complement to the music within. The first piece, “18:03”, is a smooth and pleasant environment to inhabit, forced air unwaveringly drowning out some shifting pitches relegated to the deep background. Just as water can become choppy in the breeze – and it does look like the vegetation in the aforementioned photo is swaying in the wind – “17:02” places us inside the engine of a revving, sputtering scooter, gaining in intensity until reaching ultimate guitar-feedback squall before being sharply concluded by the onset of the third track, “14:54”, which drizzles static finally subsiding as it is blown clear of the treetops. A lot of numbers, a lot of noise, and a lot to ponder. Enter Yiorgis Sakellariou, aka Mecha/Orga (a human, not an animal). A laptop-armed noise artist who loves to keep things simple: the computer is typically the only source of pain for unsuspecting, uneducated ears. Titles? What titles? The total duration is the name of the disc, the piece length baptizes the tracks. Two of them were gladly appreciated on these shores recently. 61:50 was issued by Triple Bath and it’s possibly the more “industrial” of the pair, four distinct segments whose duration ranges from 4:44 to 31:43, whereas 50:01 (Echomusic) features three connected parts seamed in a continuum of sorts, as in a single composition. In a way it is completely useless separating the merits of these records, and I’m not going to. Mecha/Orga’s material is not real racket: there’s a structure in there, and we can easily realize that Sakellariou organizes the development of the music carefully, giving it a life-like evolution that usually starts from something barely rippling silence – an interference, a hypnotic circle of energetic malaise – and gradually pumps up both the volume and the width of the sonic accumulation, building veritable walls of unfriendly emissions that literally exclude anyone and anything else from your world if “enjoyed” by headphones. Those nasty slabs of repudiated drones soon become a true force of nature (albeit of a poisoned kind), rendering the skull a potential beehive from which stinging insects carrying thoughts of annihilation incessantly fly. Still have to fine-tune the insistent imagery according to which some of the persons on the train are imagined bursting in flames while chatting about the previous evening’s TV show, but this could be a digestion-related matter (just kidding… got to give additional chances to shrinks anxious to test their patched skills on psychologically impeded beings). Guess what: these records work properly also at a lower volume. Right now (6:30 AM) I’m attempting to use it as a “distressing ambient”, yet it manages to seize the attention with its hallucinating metallic harmonics (the segment in question is the above mentioned “31:43”). The humming throb accompanying the harshness is taking control of the room, the feedback is slashing away at quietness. Hot on the heels of “61:50”, reviewed only two weeks ago, here is a new release by Yiorgis Sakellariou, also known as Mecha/Orga, probably more an incident than that Mecha/Orga joins the ranks of Merzbow or Machinefabriek. Three pieces here, each around fourteen to eighteen minutes. 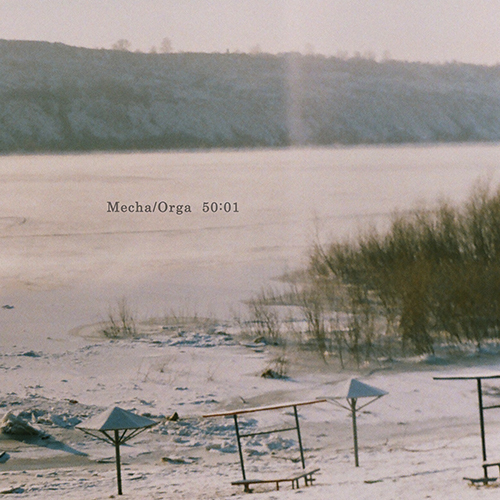 The music by Mecha/Orga is minimal – there is not always much change in them. That doesn’t mean it’s always soft. The source material is perhaps something he found outside, but in his computer treatments nothing as such can be traced back to something you may have heard outside. In “17:02” this might have been the sound of motorized vehicles, but maybe not. Its quite a loud piece, and perhaps a bit too minimal. The pieces before and after that sound like they have been recorded near the sea, but then it could have been as easily hiss from cassettes or TV static. It’s not really important, but these two pieces are great. Both are being built up in a slow manner, with small but essential changes in the sound, adding new sounds of similar source to the whole and building into an intense work. Two names that sprang to mind here, with a similar approach to field recordings, treatments and composition were Francisco Lopez and Kozo Inada (whatever happened to him, I wonder). Two great pieces and one that is nice but too long.